Google announced today that it has added five new animated Playmoji AR stickers to the Pixel Playground feature. The five, War Machine, Thor, Black Widow, Rocket and Captain Marvel, join other iconic Marvel characters like Iron Man, Captain America, Hulk, Nebula, and Okoye. This release is timed to coincide with the April 26th theatrical release of Marvel Studios' "Avengers: Endgame." To access the new characters, open the camera app on your Pixel device. Tap on More > Playground and click on the sticker icon on the bottom of the screen. That will allow you to install the new sticker pack on the phone. Once this is done, you can add the characters to your photos (including selfies) and videos. The characters will react to your expressions and each other when you use more than one at a time. In addition, Google released a video today showing what might have happened if the Pixel 3 was used during the events seen in the Avengers: Infinity War movie. In addition, a teaser posted on the Google Store today hints that on May 7th, we could see the unveiling of the mid-range Google Pixel 3a and Pixel 3a XL. The teaser says that on "May 7, something big is coming to the Pixel universe." Earlier today, a Canadian carrier leaked pricing of both phones in that country, and it appears that pricing for the Pixel 3a will start at under $500 USD, and just shy of $600 USD for the Pixel 3a XL. That compares to the starting prices of $799 and $899 for the Pixel 3 and Pixel 3 XL respectively. The reason why the mid-range Pixel might be a success is that they offer the same major selling points as the flagship models, but at a lower price. Both the Pixel 3a and Pixel 3a XL will have the same highly regarded rear camera sensors and Pixel Visual Core image processing unit found on the more expensive units. The new models will sport stock Android and will be among the first to receive Android updates. Based on leaks, both mid-rangers will be powered by the Snapdragon 670 Mobile Platform and include 4GB of memory. The Pixel 3a will be equipped with a 5.6-inch display carrying a 1080 x 2160 resolution, 64GB of storage, and a 2,915 battery. The Pixel 3a XL will come with a larger 6-inch screen sporting a 1080 x 2220 resolution, 64GB/128GB of storage and a larger battery than the one on its smaller sibling. Both models will come with a 3.5mm earphone jack and will have an all-plastic build in order to keep the costs down. Neither model will have a notch. May 7th will also kick off this year's Google I/O developer conference. During this event, we should hear more about new features for Android Q, Google's new high-end smart display and more. The next generation Pixel 4 and Pixel 4 XL most likely won't be introduced until this coming October. We do wonder about one thing Google included in today's teaser. 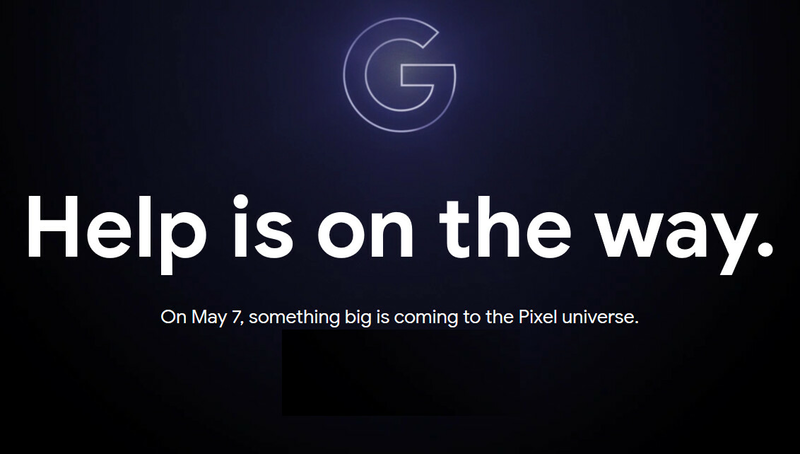 By saying that something big is coming to the Pixel universe on May 7th, could there possibly be a Pixel 3 Ultra in the works? Yes, this was a rumored premium version of the Pixel 3 XL that never appeared. Still, the wording of the teaser makes us wonder. Since these phones have been part of the leak/rumor cycle for so long, it feels like these devices are already outdated and last year's news. I'm still interested in seeing what they are like compared to their full powered cousins, though.